In the last section, we introduced a powerful tool for answering questions: the Geographic Information System, or GIS. A GIS lets us stack many different types of information on top of each other, and references every layer to the same points on the surface of the earth. In this and the next sections, we will put together different types of information in a GIS to help us answer some interesting questions. Whether you live in the heart of a historic town or city, or in a newly developed sub-division or residential community, the people who chose to live in that particular spot probably had some kind of reason for doing so. 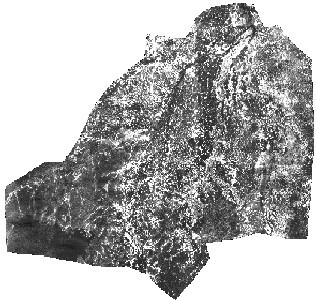 Perhaps the site was adjacent to a river that provided easy transportation in the days before automobiles and truck transport. 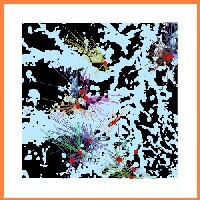 Or perhaps the site was midway between two large cities offering job opportunities. Or maybe they just liked the view. Whatever the reason, it might be fairly difficult to uncover today if no one is alive or around who remembers the founding of the place. The best that one may be able to do is to make an educated guess about the reason and then look for ways to rule out competing explanations. For example, if you suspect that the reason people chose to settle down and build homes where they did was in large part shaped by their desire to be close to existing cities with their many amenities, then you might suppose that new homes would be built very close to major roads permitting easy access. On the other hand, if you think people were driven by a need for, say, a desire to get away from the crowds in a city, then you might expect them to settle as far from busy roads as possible. These two very simplistic hypotheses, or statements about how you think the world work, provide different predictions about what the real world should look like. These different predictions are also competing, in that if the evidence supports one hypothesis, it tends to discourage or discredit the other. In this way, you might be able to reconstruct the thought processes of people from long ago, or not so long ago, as they made the important decision of where to live based on where they actually ended up. ABOVE: Phnom Rung, just the southeast of Nang Rong District, is among the handful of major constructions associated with the Angkor Empire in <?xml:namespace prefix = st1 ns = "urn:schemas-microsoft-com:office:smarttags" />Thailand. 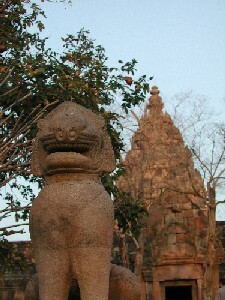 Many more such monuments are found in Cambodia. 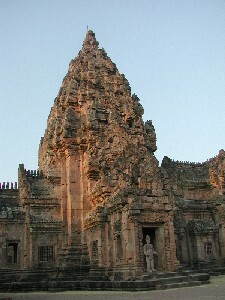 Built on a scale to rival such great monuments as the Pyramids of Giza and the great cities of the Mayans and Incas, these great Angkortemples are permanent records of a period of monumental civilization lasting several hundred years that was replaced again by subsistence farming in the Nang Rong region for nearly another 800 years. Most recently, in the 1950s, the region where Nang Rong lies was relatively empty, but became a "new frontier," as the growing population in other regions of <?xml:namespace prefix = st1 ns = "urn:schemas-microsoft-com:office:smarttags" />Thailand looked for new places to settle. Over the next 30 to 40 years, this region has filled up with people again, during a time when our knowledge of Nang Rong has also grown rapidly. ABOVE: Between 1954 (on the right) and 1994 (on the left), the amount of forest in Nang Rong (dark areas) declined dramatically. This change corresponded to the waves of settlers who moved into the region looking for land to farm. A second advantage of studying settlement patterns in Nang Rong is that a large share of the population in Nang Rong was and still is engaged in rice agriculture. Rice agriculture has certain requirements that cannot easily be overlooked, meaning that these requirements were probably on the minds of many families looking to settle. How many? Well over 80 percent of people in Nang Rong grew rice in the past, and the number is still quite high even today. In section 3, we discussed the way rice is grown in Nang Rong District. The villagers build low earthen walls, called bunds, which connect to form a series of basins that trap the falling rain. As these basins, called paddies, fill up with rainwater, they provide the wet conditions that are needed to grow rice. For the system to work best, the land must have very flat topography, or else the water would be too deep in some areas and too shallow in others to grow rice. If you belonged to a family that farmed rice for a living, it is clear that your family would need to live near a broad, flat expanse of land usable for rice farming. At the same time, your family cannot easily live in the middle of such good rice-growing land, because there is little, if any, dry land on which to build a home. Some families have solved this dilemma by building homes on stilts, but a more common solution is to build a home on a small hill or other raised area that is near good rice land. If many other families have the same idea, as often happens, the result may be a village on an area of higher land, surrounded by rice paddies. 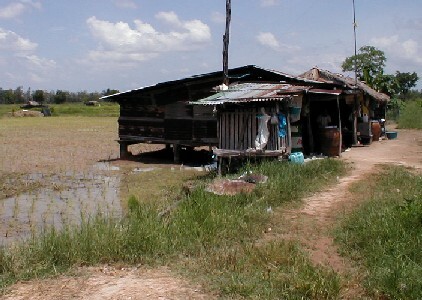 ABOVE: While homes like this one can be found on the very edges of the rice fields, or paddies, it is more common to find homes clustered in villages some distance away from the fields on higher ground. 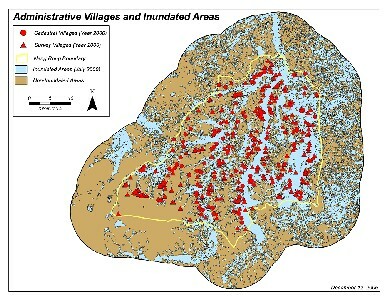 Villagers living in such clustered arrangement may walk several miles each day to reach their fields, in exchange for the security of a flood-free home. Living with neighbors nearby also provided some security from roaming criminals and wild elephants and tigers that were once quite common in rural areas. We call a village like the one shown below, in which the houses are mostly clustered together and surrounded by rice paddies a nuclear village, recalling the overly-simple diagrams of atoms from science textbooks with the nucleus in the center, surrounded by space. While the story outlined above seems to make sense of the clustering, it is not a guarantee that it is true. Other, equally sensible explanations might exist for why families and villages often end up clustered together, rather than spread out evenly. For example, maybe the families simply prefer to live close together. 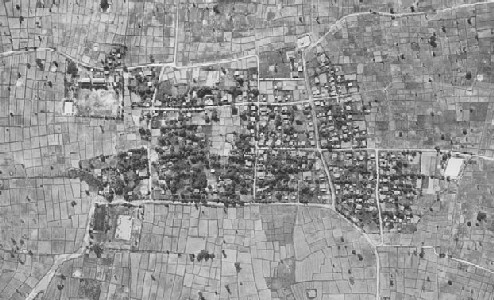 ABOVE: A nuclear village like the one shown above is one where the houses are all clustered together and surrounded by agricultural land, rather than spread out. Even the fact that they end up on the highest ground that just happens to be near rice paddies is no guarantee. Perhaps villages initially do form in the middle of rice paddies, no higher than the fields they farm, but over time, the population builds up the land artificially above the surrounding landscape to make their homes dryer. In other words, rather than seeking high ground, perhaps villagers create the high ground. How would you go about figuring out which of these, or other explanations best fit the facts? ABOVE: The map above suggests, as we suspected, that villages tend to be found just on the edge of water. 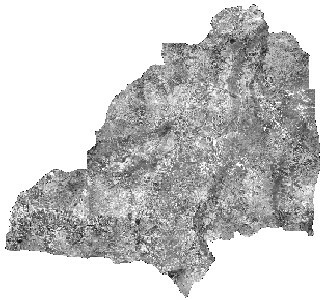 But the scale of the map is too coarse to enable us to tell more. We would need to zoom in to be sure. As mentioned in other sections, the Nang Rong Project has collected data over time, or longitudinally, which allows us to actually observe some villages as they come into being. With this information, we can at least find out where new villages are forming. This would allow us to answer some questions about the physical features that are important to villagers in choosing where to live. Elevation may be a big one, but other factors, like distance to rice land, land suitable for other types of crops, roads, and many other features may be just as important. ABOVE: The distance to major transportation lines such as roads and railways is a major factor to consider in the placement of a village. 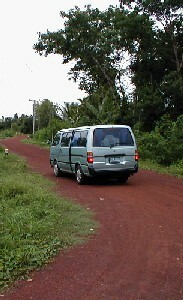 Roads permit the transport of agricultural crops, goods and services, people, and sometimes, as shown here, vanloads of researchers from Mahidol University! Another way that we can get around the problem of not being there to see some villages come into being is to ask the oldest people living there if they can recall in what year a village was established. Remember that most of our study villages in Nang Rong came into being after the 1950s. Using a GIS, we can code each village according to the date that it came into being, and examine the spatial features - social, geographic, economic, and otherwise - that seemed to attract people to those locations. None of these methods is perfect, but together, they begin to give us a picture of how people settled this "frontier" region and why they may have chosen to settle where they did. This information, in turn, may be useful in places where new waves of people are settling, or may settle in the future.